Edward, the bear, ran down to the river. He was so excited. Today was his first time going fishing by himself. Every day his mama took him to the river, but today he was going alone. He stood in the water and felt it swirl around his paws. “I have to remember what Mama said about catching a fish.” He waited until a fish jumped out of the water and then he tried to catch it in his jaws. A big green fish jumped out and flew in front of him. Edward's jaws snapped shut, but he missed the fish. A while later a red fish jumped out of the water and flew in front of Edward. His jaws snapped shut, but still no fish. Suddenly a huge pink fish jumped out of the water right in front of him. Edward's jaws snapped shut on the fish's tail. 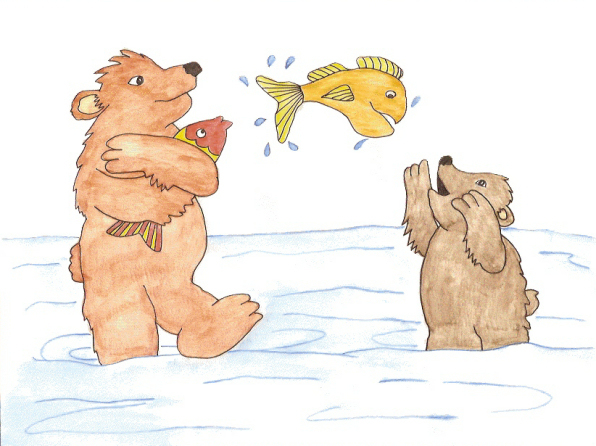 The fish squirmed and wiggled and Edward had a hard time keeping it in his mouth. He walked toward the riverbank, the fish slipping further and further out of his mouth. When he stood on the dirt, he dropped the fish and put his paw on it. “Wow! This is the biggest fish I've ever seen. Mama will be so proud of me.” He grabbed its tail with his teeth and tried to pull it onto the grass. “I will come with you and we'll catch fish together. You must be hungry by now,” Mama said. She took Edward down to the river. Mama caught a red and yellow fish and held it in her arms. Just then a big yellow fish leaped out of the water. Edward caught it in his arms. “I got it, Mama. I got it!” It wasn't as big as the one he'd caught earlier in the day, but it was enough to fill him up for the rest of the day. Mama took him home and they had honey and wild berries. “Tomorrow you can go and try to catch that big fish again,” Mama said. Edward patted his tummy and went to sleep.